Legendary bounty hunter Boba Fett! I say the legendary Boba Fett, for there can be no doubt that some vintage action figures acquire a kind of cult status and become must-haves in a collection. 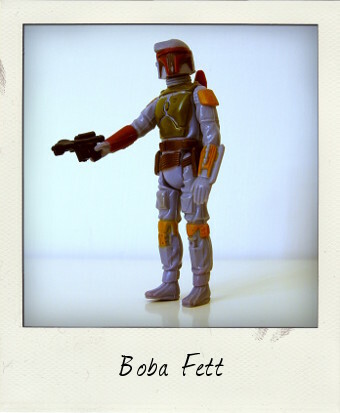 Boba Fett - everybody's favourite bounty hunter and man of few words – has always seemed to fit that role perfectly! He is hardly a rare figure and was available from his first appearance as a The Empire Strikes Back movie tie-in, right up to, and including, the Droids animation line, but he is just so perfect in his detailed moulding and paintwork, with four different extra colours added to the grey body, that he stands out on a shelf and ends up being the star attraction! An air of mystery around the prototype version of this figure began even before its release. 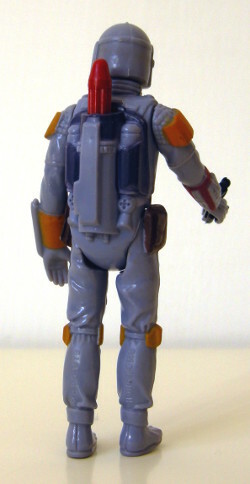 It is said, although this may even be an urban legend – if you've actually held one in your hands, please stand up and be counted – that Kenner released a Rocket Firing version of this figure, but fearing safety issues, withdrew the product. Other variations of this tale say that it never left the drawing board. Whatever the truth, I confess that the first thing I did was double check that the rocket on the back of my Boba Fett was firmly glued in place...just in case I'd happened upon a vintage action figure jackpot! Fast forward to earlier this year and current Star Wars toy makers Hasbro finally released an exact replica of the Rocket Firing vintage Boba Fett figure that never was, complete with the planned rocket firing 'J-slot' mechanism in the backpack. As is the case with so many of the vintage Kenner Star Wars action figures, there were several less dramatic variations of this figure. This is a Hong Kong version, with the copyright information stamped on one leg – C.P.G .1979 – and the country of origin on the other. His chest armour is an olive green, whilst his belt is light brown. This is supposed to be a vintage weapon too, but I have my doubts on that score...it feels a little too lightweight, is too shiny and black. You win some, as they say, and you lose some! Repro, or not, the Imperial Blaster completes this figure beautifully when displayed. I recently acquired a very cool set off star wars figurines bounty hunter ship other full sets and action figures dating from 79 to latest 1983 any help?